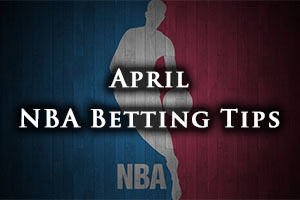 There may only be two NBA games to look forward to today, Thursday the 9th of April, but by the time we get through the round-up of NBA games on Wednesday night, we’ll probably just be finishing in time for the Thursday tip-offs! The Hornets were undone at home by the Toronto Raptors, losing by a score of 74-92 while the Bulls slipped to a narrow defeat in Orlando. The Magic held on to win 105-103 while the Nets slipped to a defeat in Brooklyn at the hands of the Hawks. The team from Atlanta held on to win 111-115 while the Grizzlies were winners at home to the Pelicans by a score of 110-74. The Spurs were also home winners, defeating the Rockets by a score of 110-98. The Jazz had more than enough about them to take on the Kings, winning by a score of 103-91 and the Trail Blazers defeated the Timberwolves in Portland by a score of 116-91. The Celtics won in Detroit, defeating the Pistons by a score of 103-113 and the Wizards won in Philadelphia, winning by a score of 90-119. Another team that grabbed an away win was the Pacers, who triumphed 86-102 in New York while the Cavaliers were winners in Milwaukee, beating the Bucks by a score of 99-104. The Nuggets defeated the Lakers in Denver, winning by a score of 119-101 and the Mavericks held on to defeat the Suns by a score of 107-104 in Dallas. The return of Derrick Rose has been a pleasing sight for basketball lovers and Chicago Bulls fans, but there is no doubt that the player needs to be eased back into action. With the Bulls playing towards the playoff, they will likely to be using Rose more often yet still sparingly in the next week in the hope that he will be good to go when the real action starts in the post season. Of course, the Heat still have plenty to play for so they should be more motivated in this game. If the Bulls lose, it will be a season high of four consecutive losses on the road, and when you take on board the fact that the Heat are in the running for the final playoff spot in the Eastern Conference, this is building up to a match that could be more enticing than many of the games you get at this point of the campaign. Roses managed 20 minutes on Wednesday night, serving up 9 points in the 105-103 loss at Orlando, but most of the team and players were delighted to see him back in action. Without him, the Bulls have managed to go 29-18 this season, but when you get a player like Rose back in action, it is definitely something to be pleased about. This game gives the Bulls a chance to get Rose on the court alongside Joakim Noah, Jimmy Butler, Mike Dunleavy and Pau Gasol, which could be the perfect build-up to the playoffs. Back in the middle of March, the Heat were in 7th place but after having suffered a 2-7 run, they are now marginally outside the playoff spots but a 105-100 win over the Hornets on Tuesday gives them a fighting chance of getting back in the running. The game same Goran Dragic grab 28 points, his best tally for the Heat since he arrived in February while Luol Deng offered up 21 points. The Bulls hold a 46-32 record at the moment and this includes a 21-18 record on the road. In their last 10 games, the Bulls have a 6-4 record. As for the Heat, they hold a 35-43 record at the moment and this includes a 19-19 record in Miami. Their last 10 game record isn’t as good, standing at 3-7. For average points scored, the Bulls lead 100.7 to 94.6 and for average points against, the Heat leads 97.3 to 98.2. Taking the Heat at -1.5, with odds of 1.90, is likely to be a bet that gives you plenty to play for on Thursday. Bet Now! The Warriors will be keen to avoid losing three games in a row, it would be the first time in close to 17 months if it does occur, but they will be up against a very tough opponent. Then again, the Warriors can also look to grab their 15th home win in a row, so the Warriors have a lot to play for in this game. They face the Blazers who will be keen to win in order to improve their chances of obtaining home-court advantage in the playoffs. The Warriors have bene up against two teams who have plenty to play for in their 2 most recent games, and perhaps it has shown in the effort and determination on offer. On Sunday, the Warriors lost 107-92 in San Antonio, who want the Southwest Division title and then on Tuesday, the Warriors fell to a narrow defeat in New Orleans. A 103-100 loss against a team who is battling hard to grab the final Western Conference spot is no disgrace, especially swhen your hard work has already put you clear of the rest. Stephen Curry provided 25 points on Tuesday night while Draymond Green provided 24 points and 14 rebounds for a double-double. Portland looked doomed when they suffered a five game losing streak but bouncing back with a 7 from 9 run has been a great response. LaMarcus Aldridge has been in fine form of late, grabbing 24 points and 13 rebounds in the opening three quarters on Wednesday night while Robin Lopez provided 18 points in a 116-91 win against Minnesota. The Trail Blazers have a 51027 record, and this includes a 19-19 record on the road. In their last 10 games, the Portland side holds a 7-3 record. The Warriors hold a 63-15 record, which includes a 35-2 record at home. Their last 10 games contain an 8-2 record. For average points scored, the Warriors lead 109.6 to 103.0 and for average points against, the Trail Blazers lead 97.9 to 99.3. Taking the Warriors, even with a handicap that is coming in at around -9.5, could be enough to provide you with a decent return for your NBA betting action on Thursday. Bet Now!